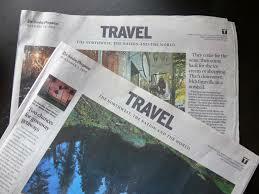 You’re perusing the Sunday Travel Section or surfing the Internet and see a fantastic price for a cruise. Is it too good to be true? What’s not included in that price? What’s hidden in the fine print? Chances are, you’re dreaming of a stateroom with a veranda but the price in the ad is for the lowest category of inside cabin. This is what we call “lead-in” pricing. It’s intended to catch your eye and it has. Typically, but not always, the prices you see in the ads are for “minimum inside” or the lowest grade of accommodation unless it specifically states otherwise. This might even be a cabin with bunk beds, and the number of cabins available at these prices are usually extremely limited. The price may also only be available to residents of certain states or may be a senior citizen fare. Beware of flashy, slick ads (especially in magazines) that throw out super low prices. Look for that little word “from” in front of the price. That means that you don’t really have any idea what the cruise really costs!!! And, also notice that these ads don’t have any dates, so you don’t know when the “from” price is good! What they do is find the lowest price available in the coming year or two, and put that in their ad as the “from” price. Pretty cute, but it doesn’t help you any. The other factor to consider is that since cruise rates are always changing (due to demand), the best ads may not be correct by the time you see them. That is why they have the fine print about “rates may change“, because they will change!! We often see rates change overnight, and occasionally they will change mid-day! Don’t be fooled by the slick ads. The only accurate way to get a correct, current rate is to call The Cruiseman, and let him check for you. Get out that magnifying glass and read the fine print. Check to see if the price includes port charges and taxes as this can easily add over $100.00 per person to the cost of the cruise if they are not included. Thankfully, recently enacted government regulations require the cruise lines to include the port taxes in the advertised prices, or else make it clear that they are not included and display the additional costs plainly. However, regulations for travel agencies are different, and many do not include additional costs in the pricing and bury them in the fine print. In all cases, unless specifically stated otherwise, the price will not include airfare but will be “cruise only”. Most cruise ad’s do not include the Govt. taxes and fees, which are going to be added in later. Look for these and other surprises in the fine print at the bottom of the ad in the fine print. 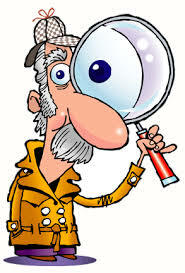 Also be on the look out for “service charges” which some agencies tack on to your bill. IS LESS MORE OR LESS? This term usually does not apply to cruises. As the lead in price is usually for an inside cabin (no window) you may wish to consider spending a little more to make your cruise that much more enjoyable. Whereas a 7 night cruise in an inside cabin may cost you $599.00 per person, upgrading to an outside or “ocean view” cabin can be as little as $50 – $100 additional cost per person. 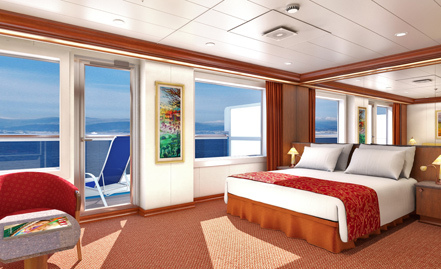 Or you may wish to upgrade to a stateroom with a veranda. This will usually cost you about $150 – $200 per person more for the week. Personally, I never sail in an inside cabin unless I am forced to. The daylight makes the cabin seem larger, and I love to wake up and see where we are and what the weather is like. Let’s be realistic, cabins aboard ship are not large to begin with so a little daylight can make them seem much more palatable. I always urge first-timers to take an outside cabin unless their budget absolutely prohibits. A stateroom with verandah will afford you your own semi-private place to watch the ship come in and out of port or just relax. These are especially desirable in Alaska, Panama canal and on longer voyages. This article was taken from http://cruiseman.com/cruising101.htm on The Cruiseman Web Site. We hope it helped. I realize that you are probably receiving dozens of emails from all kinds of cruise selling outfits every day. I get them too! Each one is trying to convince you that they have some kind of super duper exclusive deal that nobody else has. Most of our customers know that this is baloney, but for those that don’t know, I thought I’d take a minute to explain how this works. The first thing to understand is that the cruise lines set the rates. No agency can make up “special” rates and expect the cruise lines to honor them. It just doesn’t work that way! The third thing to understand is that these outfits don’t want you to know #1 & #2. They would rather fool you into thinking they have the best deals, so you’ll call them. This leads to all kinds of creative “slick” advertising, and and all those emails you keep getting bombarded with. Why am I telling you all this? Because in our 20 years of business we have always tried to be honest with people. We have never tried to fool anybody or trick them. We still think this is the best policy, and our loyal customers seem to appreciate this policy. If you see a great special deal, give us a call. We’ll check it out and make sure it’s what it seems to be, and we can book it for you without any tricks. The one exception to this rule is if an agency has cabins that were blocked at group rates. These can be an outstanding value for you. And, you don’t have to be a part of any group to take advantage of the group rates. 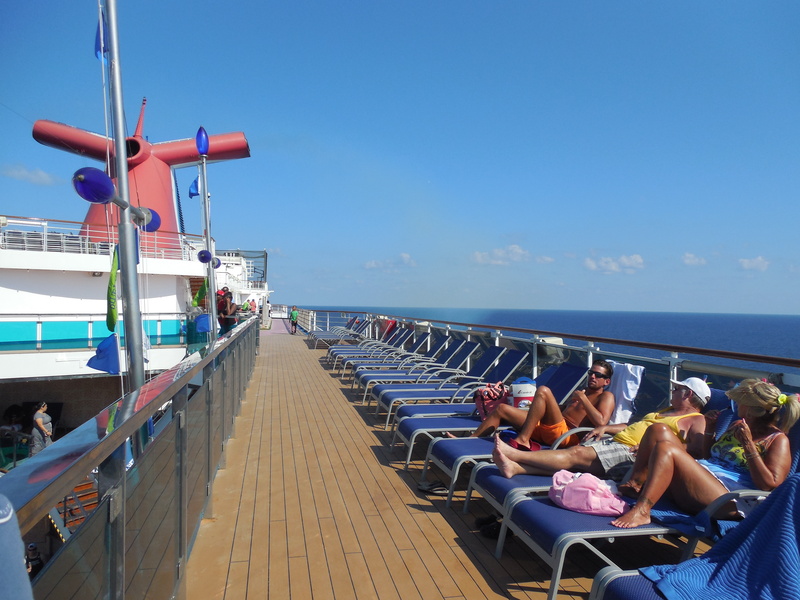 We are holding some extra cabins at group rates on 4 sailings right now. If one of these would work for you, snag one before they are all gone! Carnival Triumph from Galveston Jan 31st. CLICK HERE for all the details and group rates. 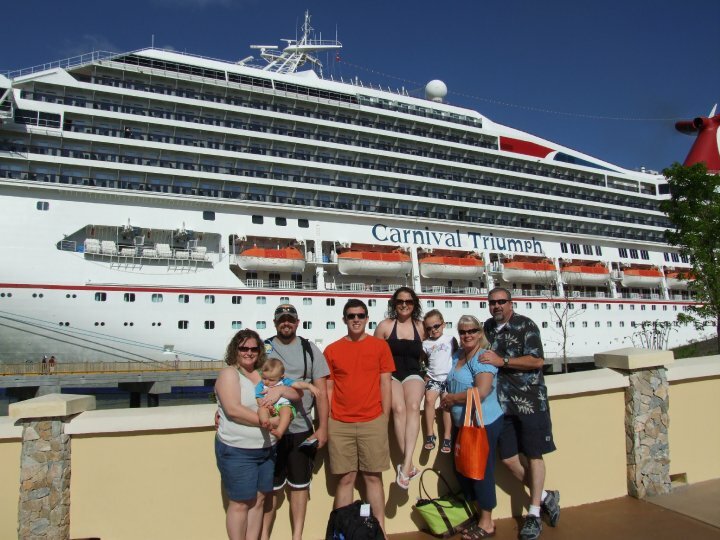 May 11-25, 2014 Phyllis & I took a two week cruise aboard the Carnival Dream. 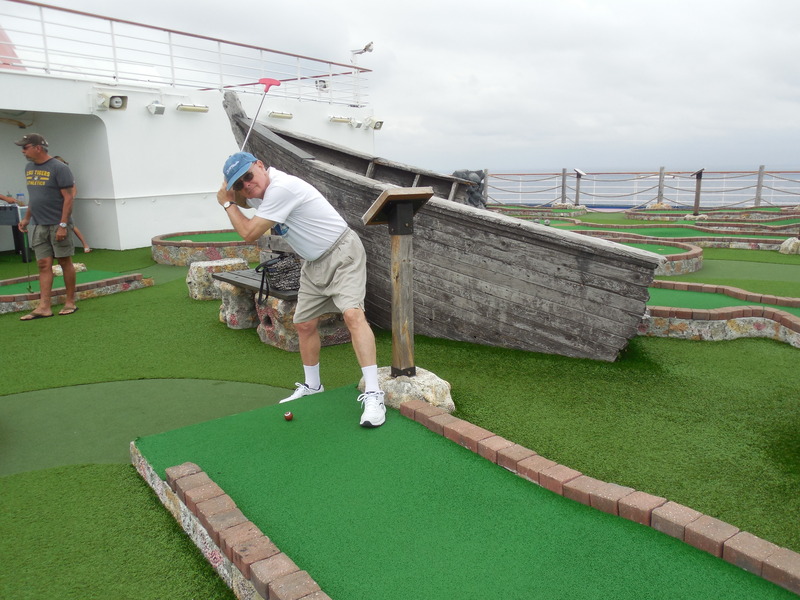 The first week we visited Key West, FL, as well as Nassau & Freeport in the Bahamas. The second week we visited Roatan, Belize & Cozumel. We have never had the chance to do a two week back-to-back cruise like this before, and I must say that everyone that loves cruising ought to do this at least once. Two weeks gave us adequate time to properly explore all the ship has to offer, see all the shows, and of course, enjoy all the casual dining options that are offered. 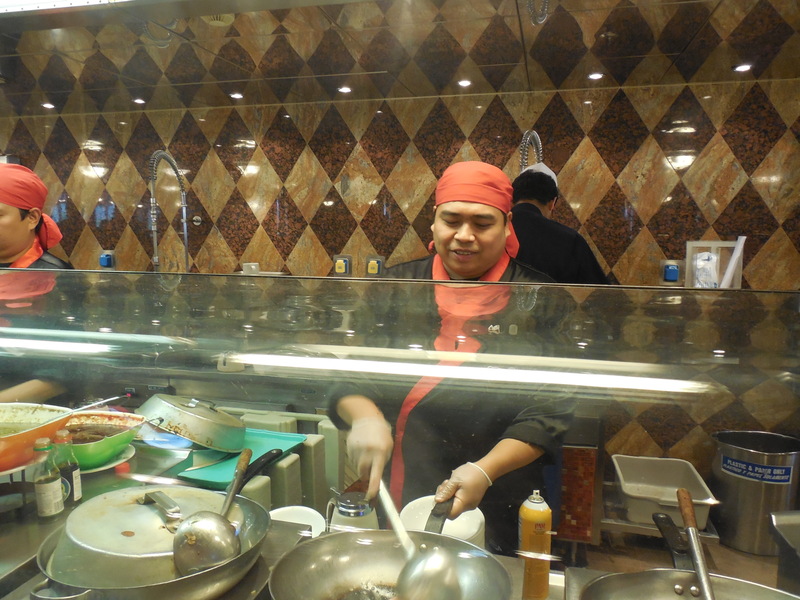 One of the most popular casual dining spots on our cruise was the Mongolian Wok. Here you pick your own veggies and meats and the chef stir fries them right in front of you. It made for a very tasty meal. The Mongolian Wok is only open at lunch time and you will probably have to wait in line a few minutes, but it was worth it. 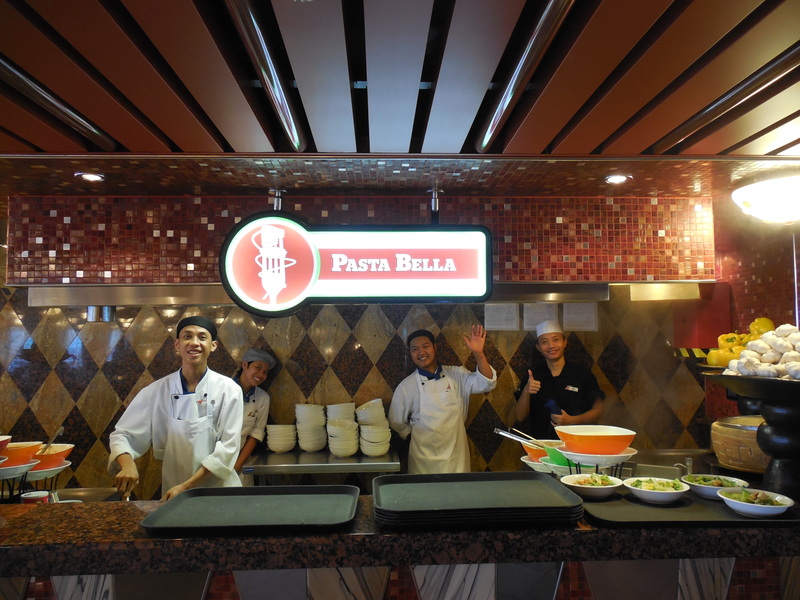 Another interesting spot is the “Pasta Bella“. Here you design your own pasta dishes, which are delivered to your table in a matter of minutes. This casual dining option is also only open at lunch time. 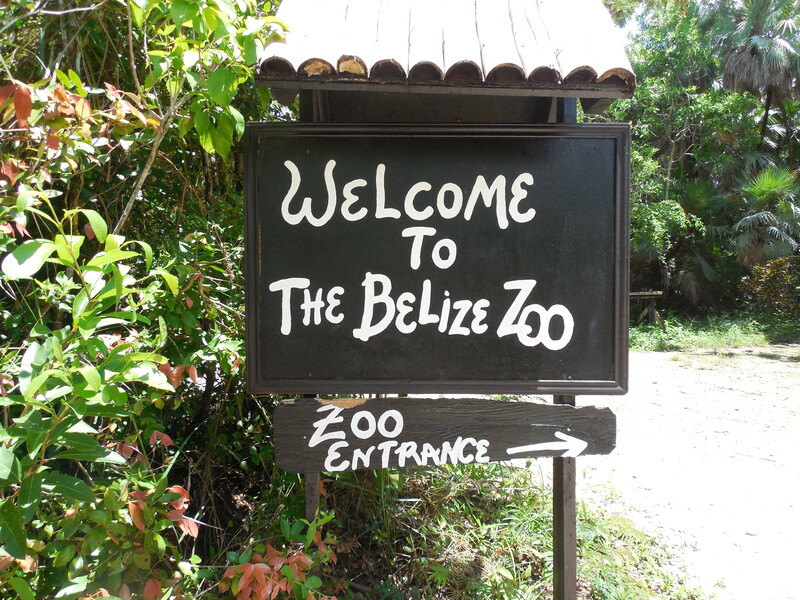 While in Belize we visited The Belize Zoo. Be prepared …the zoo is an hours bus ride away from Belize City, and the roads are not what we Americans are used to. The zoo is actually out in the “jungle” regions of Belize. This zoo features all sorts of species, all native to the country of Belize. 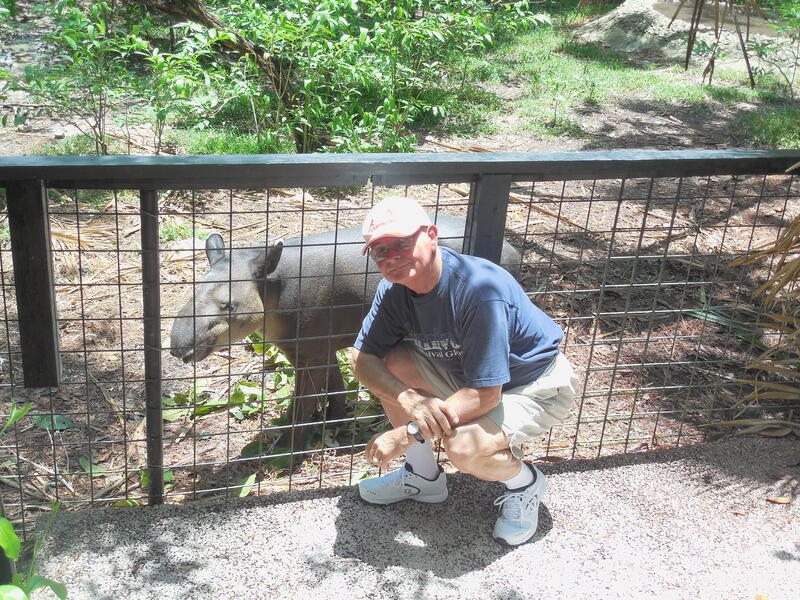 Here I am with my best buddy the Tapir. Turns out that the Tapir is the national animal in Belize. Who knew? There are so many Iguana in Belize that one might assume that they were the national animal, but they eat the Iguanas! They say they taste like chicken. I don’t know about that. Life was good on the ship. We spent time relaxing and playing golf. 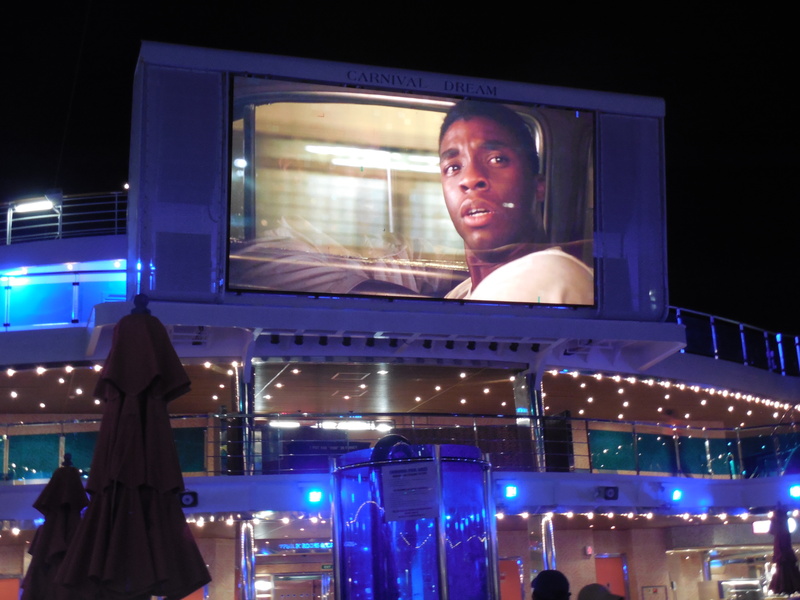 At night we watched movies under the stars. This was a lot of fun. The ship had plenty of popcorn and pizza for us. Guys — this is your chance to have a great “cheap date”! We took a trip to Chakanaab Park in Cozumel, MX. 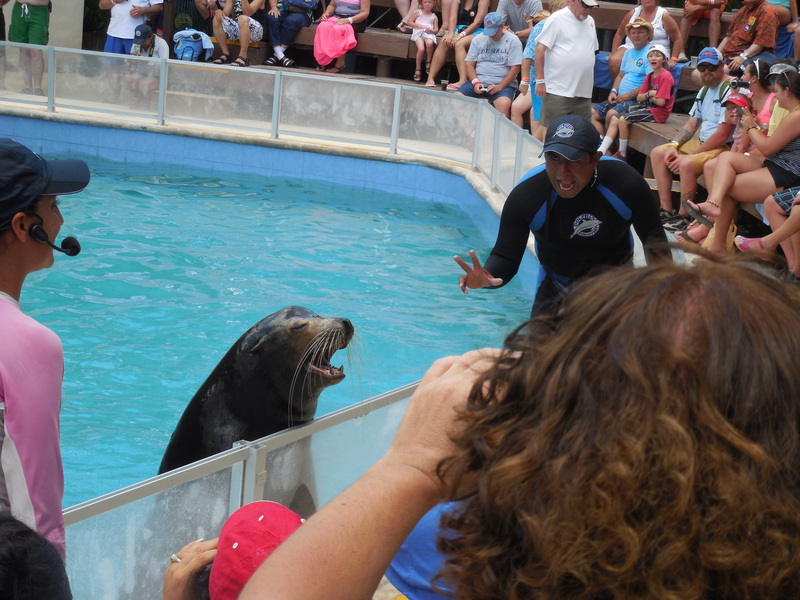 Here we got to see trained Dolphins and these amazing Sea Lions. Looking for a great beach day? 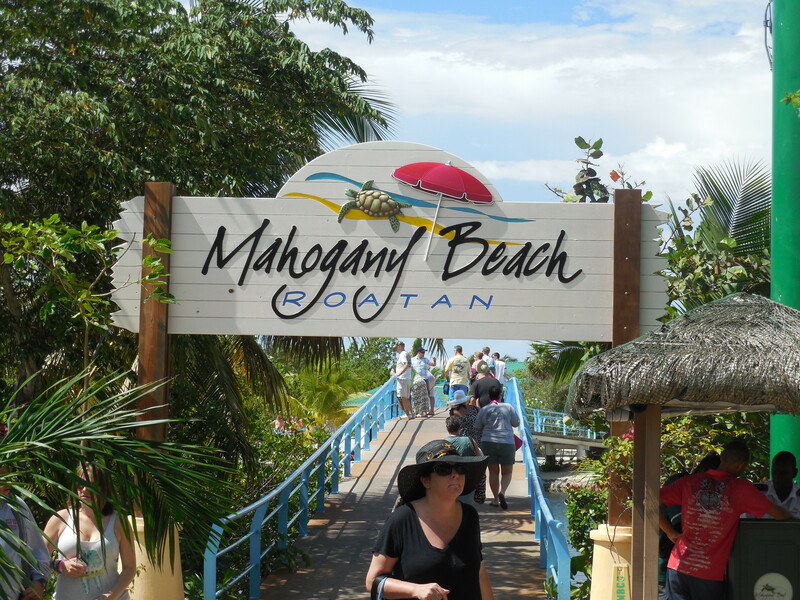 Mahogany Beach – at Roatan – is a good choice. What a view! We have lots more pictures, but there isn’t space here for them, so I’d like to invite you to CLICK ON THIS LINK and see a slide show of lots more pictures from this amazing trip. I’d love to help you plan your next amazing vacation! Please give me a call!